A company that provides employee recognition resources is a long-time client, and Brafton’s content writers were already producing written blog content that was driving traffic to its website. But as video became a bigger trend in online marketing, we thought it would be ideal to take visitor engagement up a notch. The visitors were there, but we wanted to make sure they were truly engaged with the blog content. No matter how interesting the information is, you can’t expect people to binge read articles on your site. Especially if you’re targeting a B2B audience, you have to presume your audience is busy and trying to find answers quickly. What better way than compiling information into a visual format and having someone present it your viewers? We built a video blog strategy for this company that included two-to-three short studio productions a week. That is, the client’s content writer produces custom video scripts for our hand-picked talent to present on camera. Because the same writers are producing the blog content and video scripts, they have a strong sense of what the brand’s audience is interested in, what topics are trending and what subjects will come across best in video format. Over time, the client’s video archive has grown into a learning center. In addition to articles that cover the latest research in employee benefits programs, the site now has a range of resources that teach viewers best practices in employee incentive programs. These figures prove the videos are sparking viewers’ interest and getting people to dig deeper into the company’s site, whether they’re visiting other blog posts or skipping over to product landing pages. And the best reward? An engaged visitor is more likely to become a qualified lead, and ultimately, a customer. In fact, visitors who watch videos have a conversion rate that’s two-times higher than people who only read the written blog content. The interactive format is doing its job by engaging viewers in the brand’s message and piquing their interest so they want to learn more about the company. This client isn’t alone in the success it’s seeing with video content. Here’s another example of how video became an overnight success and a top-performing marketing approach for a company that provides lighting solutions. 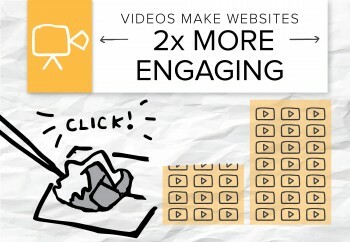 Video is highly effective because it’s interactive. It brings the written word to life and entertains visitors as they browse the web for products and services.